When I was about thirteen, I really started to get into hair products. My mother has been using deep conditioners on my hair for as long as I could remember but, it was when I was thirteen that I started to take full responsibility of my hair. The mornings of getting a cute hairdo, where gone and I was now the master of my own hair care. I'd started also going to the salon and had an actual hairdresser as well and I remember her telling me that if I wanted to keep my hair long and healthy, I had to use the best products and she showed me a shampoo and conditioner from Motions and told me to use it in between salon visits. I went home with those products and felt like a grown woman. I now had my very own shampoo and conditioner, no sharing, no communal products that my family used, nope, I had products that were specific to me. Last week, Motions sent me some of their new products and suddenly all of the memories came to the forefront and it made me nostalgic for my beauty routines as a tween. Motions is targeting the Natural hair care market but still maintaining their customers whom have relaxers as well. However, I will be the first to tell you a lot of hair care products crossover and can be used for natural, relaxed as well as transitional hair without any issue, especially the shampoos, cleansers and conditioners. When it comes to styling agents, some are specifically for natural hair such as the Define My Curls Pudding and Hydrate My Curls Pudding which have a purpose of both moisturizing as well as defining curl patterns. What I have fallen in love with as well as my present day stylist, is the Deep Conditioning Masque and the Radiating Hair Gloss. 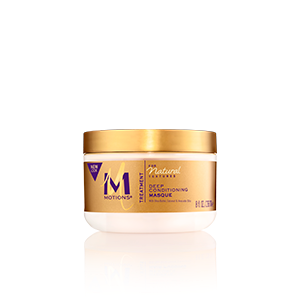 The masque is a deep penetrating conditioner rich in both coconut and avocado oil as well as Shea butter leaving the hair soft, manageable and less shedding. The Hair Gloss is a lightweight so it won't leave your hair heavy and weighed down. It provides a nice sheen and controls frizzes and fly aways. 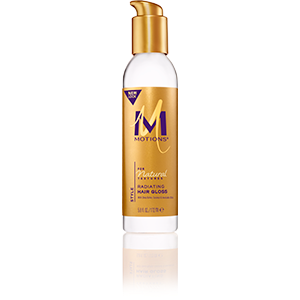 Motions is making some great moves in the ever saturated hair care market but they are still standing the test of time with quality products at a great price-point. Stay tuned this summer for reviews of additional Motions products and clink on the links to find out more about their Natural Textures line or follow them on Instagram and Twitter @Motionshair.